Fun, dance exercise to music originating in Africa mixed with European instruments and musical characteristics. Being in general an aerobic exercise, dance brings well known benefits, such as reducing the risk of cardiovascular disease, weight control and other benefits commonly associated with physical fitness. Exercise to music with your fit-ball. Fit-balls are designed to help improve the core muscle groups by focusing on strength, balance, weight distribution, posture and coordination. 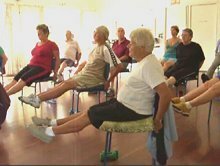 Exercise for Seniors is important. It strengthens the immune system, the internal organs, promotes better hearts and lungs. It keeps the mind sharp, the memory accurate and the bones strong. 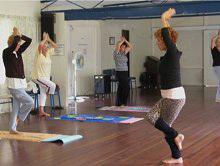 This self paced exercise group offers gentle exercises to assist in your wellbeing. Indoor Bowls is simply the indoor incarnation of Lawn Bowls, played on strips of simulation green which are a similar length to Lawn Bowls rinks. There are subtle differences to the rules but ostensibly it's the same game. Line dancing is exactly what its name implies: people dancing in lines to music. Line dances are choreographed dances with a repeating series of steps that are performed in unison by a group of people in lines or rows. All of the dancers performing a line dance face the same direction and perform the steps at exactly the same time. Although there are usually several lines of dancers, small groups may only form one line. Let's face it, social dancing is all about getting out there, relaxing and having fun. It is a pastime where you are not only meeting people but, at the same time, you are indulging in a little gentle and physical exercise. 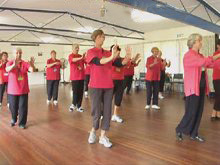 At Sixty and Better, we dance a mixture of dance styles which can also be enjoyed at different venues around Australia. All you need for social dancing is a will to have a go and the ability to laugh. Wear comfortable clothing and well-fitting shoes - preferably ones with leather soles. Tai Chi is the most prominent Chinese Martial Art of the internal style. Internal styles place emphasis on breathing and the mental component of their training. Tai Chi consists of fluid, gentle, graceful and circular movements that are relaxed and slow in tempo. Breathing is deepened and slow aiding visual and mental concentration that helps integrate the mind and body into a harmonious inner and outer self. A person living in harmony is more likely to be happy, fulfilled and healthy. Tai Chi is practiced throughout the world for its many health benefits. By learning the correct movements and principles one develops balance, body alignment, flexibility, agility and muscle strength helping to prevent falls, improving conditions eg. arthritis, diabetes, blood pressure, anxiety and stress improving and maintaining ones physical and mental health. Yoga is believed to calm the nervous system and balance the body, mind, and spirit. It is thought by its practitioners to prevent specific diseases and maladies by keeping the energy meridians open and life energy (Prana) flowing.